Red Ribbon Week — Westminster Area C.A.A.T. "C.A.A.T. sponsored the first community Red Ribbon campaign in 1987. This year’s proclamation included references to two specific issues that are relevant to teenagers today. There first concern is about the underage use of marijuana in Colorado, which became the first state to legalize marijuana for adults 21 years of age and older. The second issue of concern is the nationwide epidemic of opioid use and abuse." Thank you to Westminster Public Schools for featuring us on your website. To read the full article Click Here. Westminster Area C.A.A.T. had the pleasure of accepting the Red Ribbon Week Proclamation from Westminster City Council on October 10, 2016. Through its participation, the City of Westminster joins thousands of other municipalities in Colorado and the United States to present a unified and visible commitment to create a drug-free America. As in the past, the City is joining the Westminster Area Community Awareness Action Team (C.A.A.T. ), local schools, churches, and area businesses to take a public stand against drugs and to show a personal commitment to a drug-free lifestyle through the symbol of the Red Ribbon. CLICK HERE to access Westminster City Council Meeting Webcasts. Westminster Area C.A.A.T. Red Ribbon Chairman thanked Superintendent Pam Swanson, President Dino Valente and the board members for their continued support of Red Ribbon Week on October 11th, when we presented the Red Ribbon Proclamation to Westminster Public Schools. She reviewed the participation of the National Guard fly-in with an anti-drug message for local students. to access the full video CLICK HERE. 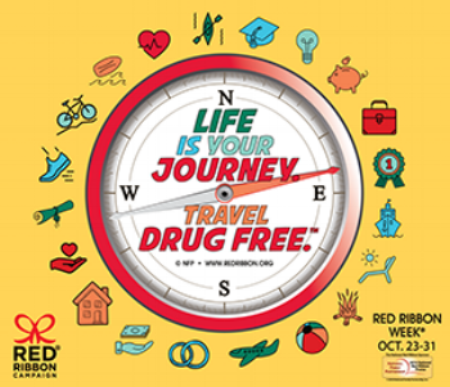 National Red Ribbon Week was celebrated the entire month of October 2015 in Westminster, Colorado. The 2015 Red Ribbon Theme was "Respect Yourself. Be Drug Free." A Westminster Area C.A.A.T. Red Ribbon Project Guide was distributed to all schools in the City of Westminster and all Adams County School District 50 schools (39 schools). Westminster City Council did a Red Ribbon Proclamation supporting and encouraging their citizens to wear and display Red Ribbons as a symbol of intolerance toward the use of drugs and celebration of a drug free lifestyle choice. Adams 50 School’s Board of Education also did a Red Ribbon Proclamation of support for the campaign in October. During October Red Ribbon, Westminster Area C.A.A.T. distributed 2400 themed inscribed Red Ribbons, 6300 themed pencils, 100 Red Ribbon Posters describing Red Ribbon and 22-100 yd bolts of red ribbon for school and community decorations. As a Coalition, C.A.A.T. along with help from the local fire departments (Westminster and Southwest Adams County), Westminster Police Dept. and Adams County Sheriff’s Dept. supported nine scheduled helicopter Red Ribbon fly-in school presentations from the Colorado National Guard Joint Counter Drug Task Force during October 2015.